I was recently contacted by The Gate, a critically acclaimed vegetarian restaurant in Islington, London. I’m not too experienced with entirely veggie restaurants – there are a couple where I live but none has ever really inspired me. However, within seconds of looking at The Gate’s menu online, I knew that next time I’m down in London visiting my family, I will do whatever it takes to make sure we go there (despite the inevitable moans of my carnivorous brothers). I’m used to there only being two or three veggie options at a restaurant, so I’m now sure how I’ll cope with having so much choice… but I know I want to give it a go. Everything sounds incredible. I was even more excited when they told me that they’ve produced two vegetarian cookbooks based on the restaurant’s recipes, and they wanted me to review one for them! Ummmm yes please. They sent me the aptly named ‘Easy Vegetarian Cookbook’, and within minutes of me opening it, I’d stuck a little bit of ripped paper in almost every page – a very good sign. However since I’d bookmarked pretty much every recipe, I had to think pretty hard about what to make. There’s a great variety of recipes in this cookbook, all of which look delicious. A lot of them use standard store-cupboard ingredients that you could probably make without needing to buy anything extra, whereas others use more exotic ingredients like seaweed or galangal – so whatever type of meal you feel like creating, there will be something in here for you. The cookbook is simply organised, with categories such as ‘brunch’, ‘pasta and rice’, ‘fritters and pastries’ and ‘spicy dishes’, so it’s easy to navigate to any recipe. The photography is stunning, and while there isn’t a photo for every single recipe (I’d say there’s probably one large photo per 3 or 4 recipes), the writing is clear and straightforward enough for you to easily picture how the other dishes should end up looking, unlike in some other recipe books. Out of around 120 recipes in total, just over half are vegan, and plenty more could easily be made vegan, which is nice to see. The only section dominated by non-vegan recipes is the dessert section, consisting of 8 recipes which all contain eggs or dairy (although several could probably be made vegan with simple substitutions). However I eventually decided to go for this baby gem salad with hazelnuts, sun-dried tomatoes and feta. It clearly demonstrates the ethos of the entire cookbook – simple and easy to make, but incredibly delicious. This salad was amazing – it took just minutes to prepare, and had plenty of tasty bits that meant I could have quite happily eaten the entire bowlful myself (and I don’t often say that about a salad!). I don’t often cook straight from a recipe, so it took a bit of willpower to stop myself from changing it too much, but I’m glad I stuck to the recipe almost entirely, because it really didn’t need anything else. With a small piece of fresh bread at the side, this made a wonderful light lunch. You might see another recipe or two from this cookbook appearing over the next few weeks, as there are plenty more that I’m desperate to try out. But for now I’ll just leave you with the recipe for this gorgeous baby gem salad. Don’t forget, if you’re in the UK you can get your own copy of this brilliant vegetarian cookbook from The Gate’s website, or if you’re in the US it’s available on Amazon. To remove the skins from the hazelnuts, roast for 10 minutes at 200°C (Gas Mark 6 / 400°F) until lightly brown. Place the nuts in a damp tea-towel and rub together until the skins come away from the nuts (I skipped this step as I like the skins!). To prepare the dressing, combine the lemon juice and olive oil, and season to taste. Disclosure: I was provided with a free cookbook to review, however all opinions are my own. I really do think this is a great book. Hi Becca! I just read your message on my blog re “Corn Fritters with Avocado Cream” and had to follow the link to your blog here…glad I did! Your blog is gorgeous and this salad sounds divine! 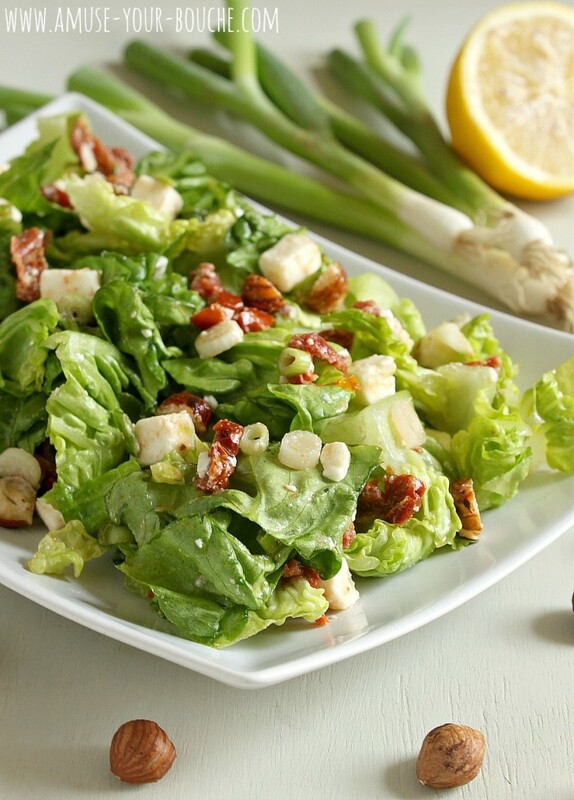 Refreshing with the lovely crunch of hazelnuts and the flavor of sundried tomatoes…and of course, my fav ingredient, feta…swoon! I’ve only just come to enjoy the brilliance that is feta cheese. Haven’t used it in a salad yet…. that cookbook sounds awesome though. I love veggie recipes books, they’re (mostly) so creative. This salad looks so light and lovely for summer! Yum! Seems we both have Salad on the brain today. I am a carnivore, but love a good dose of salad with my meal. This one looks to be really fresh. You’ve done a good job in presenting it. Hahaaa I don’t think I’ll ever get sick of that name :) thanks!